In Origin of Species, Charles Darwin acknowledged conceptual challenges to gradualism and expressed the belief that for evolution to be true, the creation of complex structures must have occurred by "numerous, successive, slight modifications" * Each of these modifications must have been functionally equal or superior to its predecessor. To imagine the evolution of species, in many cases simultaneous regression and replacement of one functional organ for another would have been required. An example of this problem is found in the proposed evolution of the whale's tail. If a whale gradually evolved from a terrestrial mammal, legs would initially have been far more effective in propulsion than a tail. Nevertheless, all proposed models of whale evolution propose imaginary forms in which the tail gradually increases in size and strength while the legs shrink. Why would functional legs regress if no end goal were in place? Another example is the proposed evolution of the bat. It remains to be explained why gradually decreasing visual acuity would be advantageous for survival in a flying mammal. Even though it is argued that a bat didn’t need good eyesight, this evades the question as to why a blind mammal would preferentially survive over one with acute vision. Rather than confront these questions, it is assumed for philosophical reasons that a bat is not intelligently designed because of its poor vision. In many proposed evolutionary pathways, the skeptic is required to imagine the creation of non-functional intermediate species. For example, the evolution of flight in birds requires the past existence of a creature endowed with transitional feathers which lacked aerodynamic qualities necessary for flight, and non-functional wings. Such a pathway would have required the sacrificing of functional forelimbs before the wings became functional. Any proposed pathway would require the creation of modifications for a future purpose. This completely contradicts the fundamental belief in natural selection. In gradual stages of transition, no amount of creative imagination can answer the fundamental question as to how an intermediate species could have been functionally superior to its predecessor. Many examples of evolutionary proposals can be cited which clearly demonstrate this dilemma. All flightless birds such as the ostrich are assumed to represent evolution from a bird capable of flight to one that has lost such ability. The question might be asked why scientists don't believe that an ostrich is evolving toward flight. The answer is because there would be no purpose for an animal to evolve feathers and wings that imparted no survival function. For this reason, the evolutionary conclusion of degeneration of a function is made. However, in the origin of birds from reptiles, evolutionists are required to imagine functional intermediate species that are conceptually non-functional. Since evolution has no long-term goal, any change that occurred in the direction of a goal would never be selected for survival unless that change benefited the species in that intermediate form. 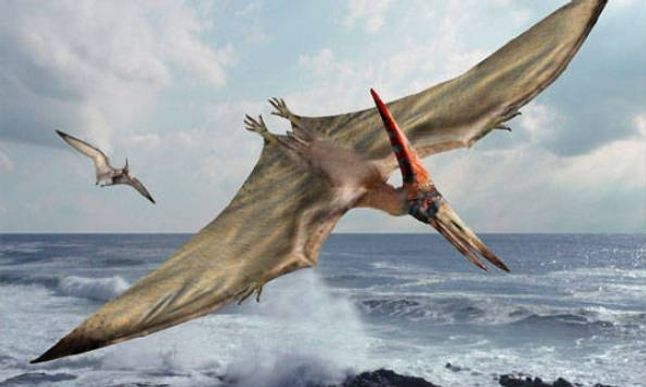 An example of such an inconceivable pathway can be found in the proposed evolution of the pterosaur, a flying reptile believed to have lived between 65 and 200 million years ago. The largest species (Quetzalcoatlus northropi) possessed a 36-foot wingspan and male adults are believed to have stood the height of an adult giraffe and weighed about 500 pounds. Paleontologists believe that the largest pterosaurs could conduct non-stop flights of 10,000 miles or more per trip by relying on updrafts of warm air and wind currents. This creature is thus believed to have been capable of intercontinental travel anywhere on the planet in a single trip on a regular basis. It is estimated that approximately 160 pounds of fat were burned during each voyage. In view of these great distances traveled, it is assumed that the creature must have possessed a sophisticated navigational system as well. Studies of fossilized skulls indicate that the portion of the brain which receives and integrates signals from joints and muscles was highly developed for complex maneuvering in the air. Despite the enormous amount of research that has been devoted to the study of these fascinating creatures, no credible proposal has been offered to explain how such an animal could have evolved. Its wings were formed by extremely elongated fourth digits on the forelimbs, and were equipped with membranous coverings including a sophisticated crisscrossing arrangement of fibers and muscles for support, permeated by an elaborate system of looping blood vessels. 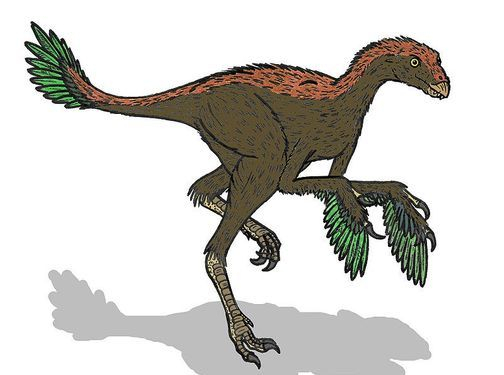 These complex membranes extended the entire length of its forelimbs to the tip of the elongated fourth digit, and formed a massive wing attached to the side of its body. Along with the elongated fourth digit, the eight bones of the carpus (wrist) were fused into one, along with partial fusion and elongation of the two bones (radius and ulna) of the forearm. The five metacarpals (bones of the hand) were also elongated and three are fused. This deformation of existing anatomy was necessary to accomplish structural integrity of the incipient wing. In addition, it is believed that a portion of its specialized respiratory system analogous to that of modern birds resided in its wings. 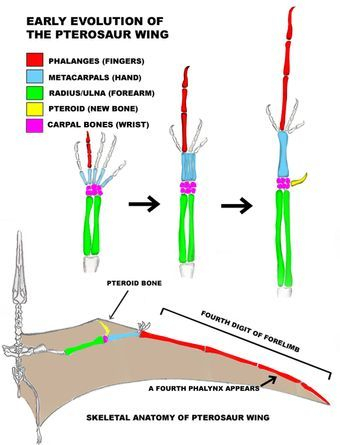 Although the pterosaur's wing is considered homologous with the forelimb of a terrestrial reptile, a unique additional bone (pteroid bone), was attached to the wrist to support the membranous wings in flight. Also, an additional finger bone (phalanx) "appeared" to result in an even longer wing. How two separate and distinct bones fortuitously appeared through evolution is a mystery. First, immensely improbable mutations would have had to have created, among other things, selective elongation of the fourth digit of the forelimbs. Such a mutation resulting in functionality has never been observed in any species in nature. Successive mutations would have resulted in progressive elongation of the same digit such that the fourth digit would have eventually achieved the entire length of the animal's body, along with the addition of a finger bone. Coincident with the elongation of the fourth digit, additional mutations would have been required to result in the deformation, fusion and elongation of other bones of the upper extremity which, along with mutations resulting in webbing between elements of the altered anatomy, resulted in a gradually functioning wing. Secondly, each and every one of such mutations would have needed to have imparted a survival advantage to the species. Such a proposal is, of course, preposterous. Any elongation of the fourth digit along with fusion of wrist bones to begin with would have certainly been detrimental to survival and therefore would have been immediately extinguished from the population. No function can be imagined. There is no explanation why a pterosaur or any other animal that purportedly evolved flight would continue for millions of generations improving upon a useless wing that would have only hindered survival. Paleontologists understand that any conceived version of a partially developed pterosaur would be dysfunctional because it could neither fly nor run. Finally, multiple additional mutations would have had to simultaneously appear in a coordinated fashion, to result in the capacity to fly and maneuver in the air. Without these additional mutations, all other mutations would have been a detriment to survival. Scientists have devoted years of research in attempts to understand how this creature could fly. Some have suggested that it needed to jump from high trees or off cliffs to become airborne, while others have proposed that it propelled itself into the air by jumping off the ground using all four legs. Whatever the mechanism, all behavioral adaptations that would have enabled the creature to fly would have needed to appear through chance substitutions of genetic code. If the creature needed to jump off cliffs to become airborne, then the counter-intuitive instinctive behavior to do so would have needed to co-evolve along with the altered anatomy. It is believed that in order to accomplish powered flight, the creature not only flapped its wings, but assisted flight by rhythmic movement of its lower extremities which were attached to the lower portions of the wings. The control of all of these coordinated motor activities had to evolve by way of thousands of fortuitous mutations. It must be remembered that for such mutations to create altered anatomy, they would also be accompanied by detrimental effects, due to the poly-functional nature of genetic information. Coordinated flight in response to varying conditions such as wind and updrafts involves exceedingly complex neuromuscular pathways. In addition, extensive webbing composed of muscle and connective tissue support had to appear through more mutations, along with multiple additional anatomical changes including hollow bones, to empower the creature with the ability to fly. Obviously, simple elongation of the arms and fourth digits, mutations which are exceedingly improbable in and of themselves, would not have provided any survival advantage and would assuredly have been a detriment to survival. Computer programmers have spent thousands of hours generating digital code to enable fully equipped robotic pterosaurs to fly. The proposal that random trials on a keyboard could ever result in such purposeful code would be immediately scoffed at by anyone familiar with computer technology. Yet an analogous proposal, that of random mistakes in genetic code replication, is assumed to have resulted in flying reptiles. With a mindset of atheism, it is tempting to look at the end result (structure of the pterosaur's wing) and conclude that such is related to the forelimb of terrestrial reptiles on the basis of homology. Those who are pre-committed to naturalism imagine that such a transmutation is simple. 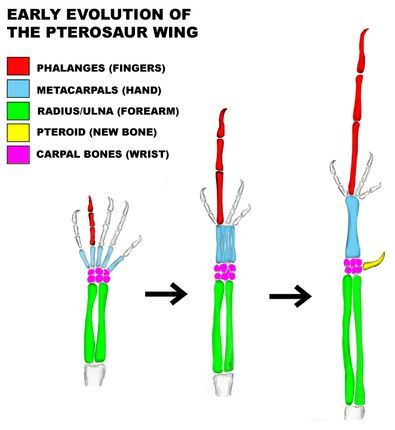 The primary anatomic differences between a pterosaur's wing and a lizard's forelimb are the proportions of its individual components and webbing. However, any proposal as to how such a design was accomplished by evolution must be extremely simplistic so as to conceal its impossibility to anyone who critically analyzes the facts. No functional intermediates can be imagined that could have been acted upon by natural selection. Any evolutionary proposal would have required the existence of an end "goal" ( i.e., intelligent design) in its progressive transmutation. No explanations have been given as to why no transitional species of flying reptiles exist. This is despite the finding of over 1,000 fully developed fossilized specimens, all perfected in their ability to fly, spanning a supposed time period of over 130 million years. It is perplexing that paleontologists continue to search for precursor forms, when the anatomy of such hypothetical species cannot even be imagined.